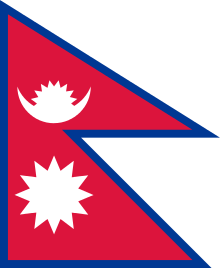 Sherpa (ཤར་པ།, EWTS: sher-pA, Nepali: शेर्पा भाषा; also Sharpa, Sharpa Bhotia, Xiaerba, Serwa; ISO 639-3: xsr) is a language spoken in Nepal and Sikkim mainly by the Sherpa community. About 200,000 speakers live in Nepal (2001 census), some 20,000 in Sikkim (1997), and some 800 in China (1994). The above days of the week are derived from the Tibetan language ("Pur-gae"). Sherpa is a SOV language, written using either the Devanagari or Tibetan scripts. Nouns are defined by morphology when a bare noun occurs in the genitive and this extends to the noun phrase. Defined by syntactic co-occurrence with the locative clitic, comes first in the noun phrase after demonstratives. Demonstratives are defined syntactically by first position in the NP directly before the noun. Quantifiers: Number words occur last in the noun phrase with the exception of the definite article. Adjectives occur after the noun in the NP and morphologically only take genitive marking when in construct with a noun. Verbs may morphologically be distinguished by differing or suppletive roots for the perfective, imperfective, and imperative. They occur last in a clause before the verbal auxiliaries. Verbal Auxiliaries occur last in a clause. Postpositions occur last in a postpositional NP. ↑ Hammarström, Harald; Forkel, Robert; Haspelmath, Martin; Bank, Sebastian, eds. (2016). "Sherpa". Glottolog 2.7. Jena: Max Planck Institute for the Science of Human History.